And Eat Right To Manage Your life! Are you eating just to whet your appetite or to satiate your taste buds? Or are you eating in order to take better control of your life? You're about to discover how you can make your life much more optimal just by making sure that you eat right. tickTeaching all these things to someone else! One generation ago, people would not dream of picking up whatever packet of junk food they could get at first in order to feed their faces. Today, we do that so very casually. I am hungry usually means I want a hamburger or a frankfurter, probably with chips on the side and one cola. Lets go out and party means Lets go out and booze till we cant stand up on our own and intersperse the drinks with as much synthetic-laden wannabe Chinese food that we can get. And, I am on a diet means I am on a chemically driven pill which will kill my hunger and deprive my body of vitamins. 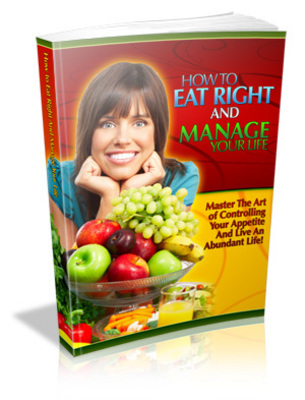 Right Away And Get A Real Look At 'Eat Right And Manage Your Life'!